Washing machines are one of the most utilitarian appliances that technology has given rise to. They not only take a huge workload off your back but also offer customized and more efficient solutions to wash and dry your clothes. Because of the increasing popularity of washers, manufacturers have gone all out and have churned out one model after the next. With so many variants out there in the market, choosing the best top load washer has become a perplexing task. To help you solve that conundrum, we've created this article, wherein we've curated a list of the best top load washers. The article also explores their advantages and disadvantages and explains the features of some of the best top load washers you can get in 2018. Speed Queen TR3000WN 26 Inch Top Load Washer With 3.2 Cu. Ft. 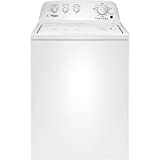 Speed Queen TR7000WN 26 Inch Top Load Washer With 3.2 Cu. Ft.
LG WT7500CW 5.2 Cu. Ft.
GE GTW750CSLWS 27 Inch Top Load Washer With 5 Cu. Ft.
Whirlpool WTW4616FW 3.5 Cu. Ft.
1.0.1 1. What Is a Top Load Washer? 1.0.2 2. What Are the Advantages of a Top Load Washer? 1.0.3 3. What Are the Factors to Consider before Getting the Best Top Load Washer? 1.0.4 4. Where Can You Buy the Best Top Load Washer? 1. What Is a Top Load Washer? The answer to this question is in its name. A top load washer is a washing machine that lets you load your laundry from the top as opposed to loading it from the front. Top load washers are pretty much standard models, having been around the laundry scene for quite some time. 2. What Are the Advantages of a Top Load Washer? A top load washer offers a ton of advantages. For one, it is easy on your back as you don't have to bend over to load your clothes into the machine. This makes it the ideal option for elders and for people with back issues. This model is also more affordable, takes up less space, and typically requires less maintenance than a front load washer. 3. What Are the Factors to Consider before Getting the Best Top Load Washer? Before you decide to purchase the best top load washer, it would be advisable to keep some factors in mind, such as the total capacity of the washer, the energy efficiency, its maintenance schedule, the possible repair costs, the life expectancy of the appliance, its warranty, and its price. 4. Where Can You Buy the Best Top Load Washer? You can get some of the best top load washers from online marketplaces such as Amazon, Walmart, Target, and Best Buy, among others. Or, you could visit your local consumer electronics store to check them out in person and get a good idea before rounding up on the best top load washer. We conducted meticulous research on the internet to come up with a list of the 6 best top load washers of 2018. Once the list was done, our team of reviewers critically analyzed each of the entries in the list based on their features, their pros and cons, their price, and their warranty. Then, our team compared and contrasted each washer with the others in the list and pored over plenty of user reviews to come up with a just and fair verdict. The pricing of the best top load washer starts as low as $700 and goes all the way up to around $1,500. The price primarily depends on the brand, the technology it uses, the feature list, the efficiency, and the build quality. While a low priced top load washer can still be a good bet, it usually lacks a lot of features that are typically found in more expensive washers. Also, more expensive models of top load washers generally come with a longer warranty period and better build quality. Equipped with easy to operate mechanical controls, the Speed Queen TR3000WN 26” top load washer features a rugged and durable construction that's built to last for years. The washer sports premium metal components with a three-coat finish that is resistant to corrosion and rusting. The tub of the washer is made from high-quality stainless steel and has a maximum capacity of 3.3 cu. ft. The top load washer also features an agitator that moves at 68 strokes per minute and leaves your clothes clean and stain-free. With up to 4 preset cycles and 3 temperature settings, the washer can handle many garments including sheets, pillow cases, curtains, and comforters. The washer motor with a G-force rating of up to 150 quickly extracts water from the tub. The Speed Queen TR3000WN 26” top load washer can be found online. The Speed Queen AWN432SP 26” top load washer comes with a 3-year warranty. Featuring a solid mount suspension system, the Speed Queen TR7000WN is perfectly balanced and produces very less vibration and noise. The tub is made from stainless-steel, and is non-corrosive and highly resistant to rust and oxidation. The LED display on the front of the washer is bright and readable, and displays the exact time remaining for the cycle to end. Unlike most top load washers, the Speed Queen TR7000WN fills up entirely with water to provide maximum rinsing capability. The washer features electronic controls that are touch-enabled, making it easy to customize the wash cycle according to your needs. And with up to 8 different preset wash cycles and 4 temperature selections, this top load washer can handle anything you throw at it. The Speed Queen TR7000WN 26-inch top load washer can be found online. The Speed Queen TR7000WN 26-inch top load washer comes with a 7-year warranty. The GE GTW750CSLWS is a smart top load washer with innovative features like the Wi-Fi Connect, which lets you control and monitor the wash cycle remotely from anywhere with a smart device. It is also equipped with Smart Dispense technology that takes in around 75 oz. of detergent liquid and uses only the required amount as and when needed during the wash cycle. A faucet built right inside the washer dispenses both water and detergent, and you can use it to pre-wash your clothes and get rid of stubborn stains. The Deep-Fill feature of the washer allows you to customize the water level according to your needs with just a push of a button. Besides this, you can wash your clothes in hot or lukewarm water. Also, the washer comes with 13 different wash cycles, 6 temperature settings, and a maximum capacity of 5 cu. ft. 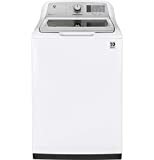 The GE GTW750CSLWS 27-inch top load washer can be found online. The GE GTW750CSLWS 27-inch top load washer comes with a one-year limited warranty with up to 10 years for the motor. Dimensions (WHD): 27" X 44 1/2" X 28 3/8"
Equipped with the patented Direct Drive motor, the LG WT7500CW eliminates the traditional belted drive system in favor of one that is connected directly to the tub. This ensures minimal transmission and friction losses along with a significant reduction in noise and vibration. With an extra-large capacity of 5.2 cu. ft., the washer is perfect for heavy and large loads. The washer also features TurboWash technology that helps you cut down on the time taken to complete a wash cycle by up to 30 minutes. Unlike traditional top load washers, the LG WT7500CW moves the water in 6 different ways using the 6Motion technology, giving your clothes a thorough cleanse. The drum is made from high-quality stainless steel that is resistant to discoloration, corrosion, and rust. The washer is equipped with a transparent glass top lid that lets you see the progress without having to lift the lid each time. LG's SenseClean system also allows the machine to automatically set the water level according to the amount of wash load for maximum conservation of water. The LG WT7500CW 5.2 Cu. Ft. top load washer can be found online. LG offers a 10-year limited warranty on the Inverter DirectDrive motor of the LG WT7500CW and a lifetime warranty on the drum. Equipped with a rust-resistant stainless steel tub with a maximum capacity of 5.1 cu. ft., the GE GTW810SPJMC top load washer is perfect for washing heavy loads such as beddings and comforters. The washer supports the Wi-Fi Connect feature that lets you control the washer remotely using a compatible smart device. It even works with voice assistants such as Amazon Alexa and Google Assistant. The top load washer also delivers great performance while maintaining low noise levels with the help of noise dampening materials. If you are ever in a hurry, you can use the time saver function of the washer to cut down the time taken to complete a wash cycle by up to 20 percent. Furthermore, the Deep Rinse and Extra Rinse options ensure that your clothes are clean and free from soap suds. The GE GTW810SPJMC 5.1 Cu. Ft. top load washer can be found online. The GE GTW810SPJMC 5.1 Cu. Ft. top load washer comes with a 1-year limited warranty. This top load washer is for someone who want to get more extra space they need with the Whirlpool WTW4616FW 3.5 cu. ft. top load washer. Take on dirt with this washer thanks to the Deep Water Wash option that fills the white porcelain tub wash basket with more water to help break down loose soils. Caring for delicates and other fine washables is easy with the Delicates cycle. Meet your family’s day-to-day needs by caring for loads of business clothes with the Casual cycle or keeping darks and brights looking their best with the Cold Wash cycle. The Whirlpool WTW4616FW 3.5 cu. ft. top load washer can be found online. The Whirlpool WTW4616FW 3.5 cu. ft. top load washer comes with a one-year limited warranty. Based on our review of the 6 best top load washers of 2018, the LG WT7500CW comes out as the best overall top load washer. With an extra-large drum that's linked to a patented DirectDrive motor, the LG washer is quiet and free from annoying vibrations. The TurboWash feature significantly reduces the wash cycle times and is ideal for people who are in a hurry. Also, the SenseClean system helps you conserve water. While the price tag of around $1,400 is a little too high, the washer more than makes up for it with its exceptional build quality and warranty terms. Alternatively, for people who are slightly more budget-conscious, the Kenmore Elite 31433 Top-Load Washer and the GE GTW750CSLWS are some of the best top load washers you can get at a low price point.